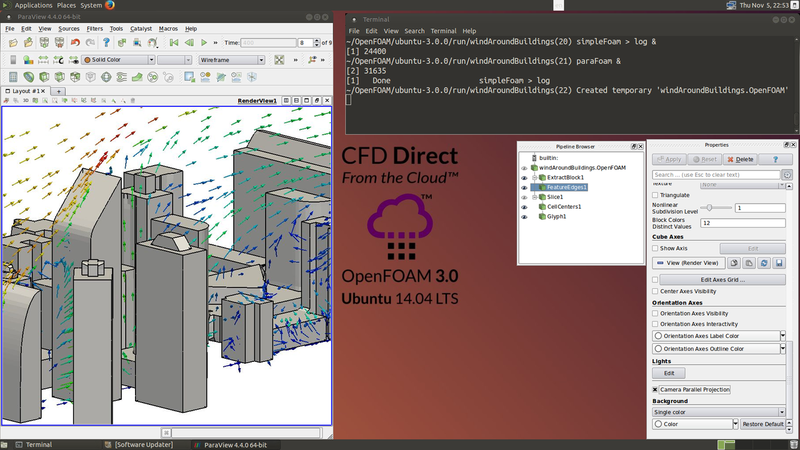 In November 2015, we launched CFD Direct From the Cloud (CFDDFC), a complete OpenFOAM cloud computing platform that includes the latest version of OpenFOAM and supporting software, e.g. ParaView, Scotch, OpenMPI, etc., running on the latest long-term support (LTS) version of Ubuntu GNU/Linux. Unlike most providers of cloud solutions for CFD, the software for CFDDFC is 100% open source, with no costly, proprietary software interface, allowing users to enjoy fully the financial benefits of moving to the cloud. Users access the service using public key encryption with SSH either by connecting directly from a terminal or, optionally, with a visual environment via a remote desktop. The platform provides OpenFOAM in its native Linux OS, with the remote desktop available for Linux, Mac OS X and MS Windows. CFDDFC is supplied for Amazon Web Services (AWS) as a product on AWS Marketplace, with the software pre-configured as an Amazon Machine Image (AMI). Anyone wishing to use the software simply needs to setup and configure as a AWS user, then launch an instance of the AMI on Amazon Elastic Compute Cloud (EC2). CFDDFC is in constant use, on a range of EC2 Instances ranging from the small instance (t2.micro), eligible for Free Tier, to the Compute Optimized instances including the largest with 36 virtual (18 physical) CPUs (c4.8xlarge). Users have also created a CFD cluster of multiple networked instances for larger workloads. Since its launch, we have received only positive feedback for the service.